Greeting friends and family. Thank you for your interest In helping two young Zambian women, Carol and Lucy. I live in Kapanda village with these two girls in the Northern Province of Zambia. In the many months I have been here I have grown very close to these girls. They are both smart, strong and loving girls that have shown how much they want to continue their education. They both started grade 8 at the end of January but do not have the means to continue paying school fees so I’m asking for your help. Please click on the link below to donate any amount and indicate in the ‘notes’ fields which girl you are supporting. Carol is the first born living in a rural village in Kasama District in the Northern Province of Zambia. She lives with both her parents and has six brothers and one sister. Her parents first came to their Peace Corps volunteer, Megan, asking for support to send Carol to secondary school. Both of her parents are small scale farmers and Carol does a lot to help out her family and wants to make them proud. 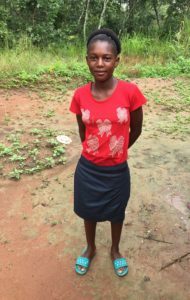 Carol is eager to continue her education and to show her enthusiasm she has been going to Megan’s house to have reading and writing lessons in Bemba and English. She hopes that by continuing her education she can achieve her dreams of going to university. Lucy is a fifteen year old girl and is the sixth born in a family of eight. She has five brothers and three sisters. Lucy and her family live in Kapanda Village in the Northern Province of Zambia. Her parents support their family as subsistence farmers. Lucy works hard in the fields with her family and worked hard to finish primary school. She has started grade 8 in the secondary school close to her village however her parents do not have the means to continue to support her. Lucy hopes to go to university and become a nurse one day. She looks forward to continuing her studies and becoming a graduate one day with your help! !